After a nearly perfect pregnancy, Erika Anderson was shocked when, during delivery, the nurses suddenly called for the physician, who rushed her to the operating room for an emergency C-section. The nurses became alarmed when they noticed something wrong on the fetal monitoring strips, which are print outs of the baby’s heart activity in response to the mother’s contractions. Sadly, the nurses didn’t notice the abnormal heart tracings soon enough, the physician did not perform an emergency C-section quickly enough, and the baby was deprived of oxygen for too long. Baby Landon’s umbilical cord had been wrapped around his neck (nuchal cord), and this caused a severe decrease in the flow of oxygen-rich blood to his brain. Landon had a seizure at birth and was diagnosed with hypoxic ischemic encephalopathy (HIE), which is a brain injury caused by oxygen deprivation. Landon had seizures for the first 6 weeks of his life, and his parents are now trying to find a way to get the little boy the treatments and therapy he needs. Landon is almost 2 months old. HIE is brain damage caused by oxygen deprivation in the brain. This deprivation can be caused by a lack of oxygen in the blood (hypoxemia / hypoxia) or a lack of blood flow in the brain (ischemia). A nuchal cord is when the baby’s umbilical cord is wrapped around the baby’s neck 360 degrees. Sometimes the cord ends up in a true knot and cannot be undone. Nuchal cords can form at any time. Sometimes they form and disentangle, and sometimes they stay in a knot. In some cases, a nuchal cord may not affect the pregnancy. But in many cases, a nuchal cord causes restriction of blood flow, depriving the baby’s delicate brain of oxygen-rich blood. There is restriction of carotid (neck) artery blood flow because the cord is wrapped tightly around the baby’s neck. There is severe congestion of venous blood flow – the blood flow gets backed up and doesn’t circulate properly. There is compression of the umbilical cord vessels themselves when the cord becomes tightly compressed against itself or the baby’s neck. In other words, the umbilical cord is impinged upon so blood cannot easily flow through the cord to the baby. Knowing when a baby is in distress during pregnancy, labor and delivery is very important because fetal distress represents a lack of oxygen in the baby. When a fetus is deprived of oxygen, it is very serious because physicians do not have instant access to the baby when oxygen deprivation and fetal distress occur. Instead, the process of delivery – often by an urgent C-section – has to take place before physicians are able to directly help the baby with oxygenation and circulation. 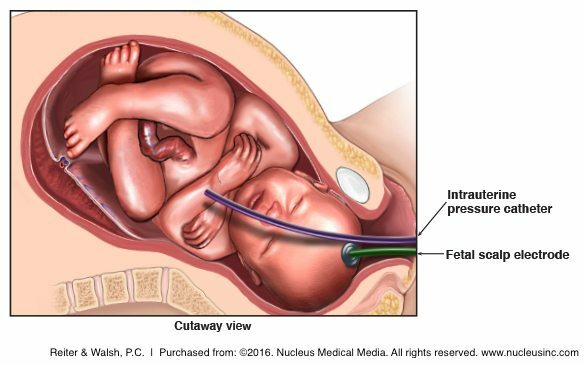 In many cases, simply delivering the baby so she can breathe on her own is the main action that needs to occur because it removes her from oxygen depriving conditions, such as a nuchal cord. However, physicians and nurses may not be aware that a baby is in distress if the baby is not being monitored with a fetal heart monitor, or if data on the fetal monitor is being ignored or misinterpreted. If a baby’s hypoxia and distress are not recognized, HIE and other permanent brain injuries can result. In baby Landon’s case, the abnormal heart tracings, called nonreassuring heart tracings, were not recognized quickly enough, and a timely C-section did not occur. In fact, a physician was not even in the room during labor. Research has shown that one of the causes of birth injuries is failure to react appropriately to nonreassuring fetal heart tracings, and this failure is often due to a lack of knowledge in interpreting fetal heart tracings, as well as a failure of communication among the members of the medical team. The hospital must make sure that the staff members who are monitoring mothers and babies during labor and delivery are skilled in interpreting fetal heart tracings, so that even subtle changes on the fetal heart monitor are noticed. The medical team must recognize abnormal tracings before they become very serious. In addition, data on the heart monitor must be communicated to members of the team taking care of the mother and baby. If a physician is out of the room and cannot be quickly reached, this constitutes a breakdown in communication. Furthermore, when a mother is in labor, the medical team must have the capacity to quickly perform an emergency C-section. 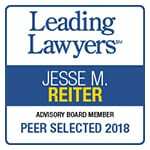 Medical personnel involved in labor and delivery should be aware of the fact that there are many dangerous conditions that can occur during labor and delivery that can cause the baby to be severely oxygen-deprived. Thus, the ability to quickly react to this situation means that 1.) a fetal heart rate monitor must be appropriately placed, and staff that are very skilled in heart tracing interpretation must be present; and 2.) communication among staff members must occur, and the physician must be present and ready to quickly deliver the baby by emergency C-section, should the need arise. Seizures are an indication that a brain injury has occurred, and in many instances they are the first indication that a newborn has HIE. Seizures can be caused by HIE, but they can also be the cause of further brain damage. Seizures can injure the brain, and the more frequent and severe the seizure activity is in the baby, the more damage there is to the brain. It is therefore crucial that seizure activity be recognized and treated as soon as it occurs. When physicians suspect that an insult occurred that can cause HIE, the baby should receive treatments to help minimize brain damage. One such treatment is hypothermia or brain cooling. In hypothermia treatment, the baby’s body or head is cooled so that the baby’s core temperature is lowered to 91 degrees Farenheit (33 degress Celsius) for about 72 hours. It is crucial that this therapy be initiated as close to the time of the oxygen-depriving incident as possible. Most experts agree that hypothermia treatment should be started within 6 hours of the insult. The purpose of hypothermia treatment is to reduce the baby’s body temperature so that the metabolic rate slows, allowing cell recovery over a longer period of time. This avoids further damage that can occur if normal oxygenation or blood flow is restored too quickly to injured cells. The desired outcome is little or no brain damage. Furthermore, minimizing injury to the brain decreases the likelihood of seizures and further brain damage. In addition to treating the underlying cause of seizure activity, it may be necessary to treat the actual seizures to help prevent more brain injury. Physicians sometimes give babies antiepileptic medications, if indicated. The physician and medical team must be very skilled at interpreting fetal heart rate tracings and handling issues that arise during labor and delivery that can deprive the baby of oxygen. The team must be adept and able to act quickly. Failure to properly monitor and treat the mother and baby during pregnancy, labor and delivery is negligence. Failure to diagnose and treat problems such as HIE and seizures in a baby after birth is also negligent. If this negligence leads to injury of the baby, it is medical malpractice. 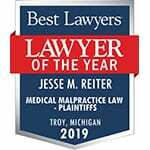 The nationally recognized lawyers at Reiter & Walsh ABC Law Centers have decades of experience in birth injury cases, including HIE, seizure and nuchal cord cases. If you experienced complications during pregnancy and your child developed an injury such as a seizure disorder or HIE, we can help you. 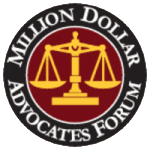 Our award winning attorneys will work tirelessly to obtain compensation for treatment, therapy and a secure future for your child. Email or call us at 888-419-2229 for a free consultation. Thank you for your comment. A member from our team will reach out to you shortly to better assist you.